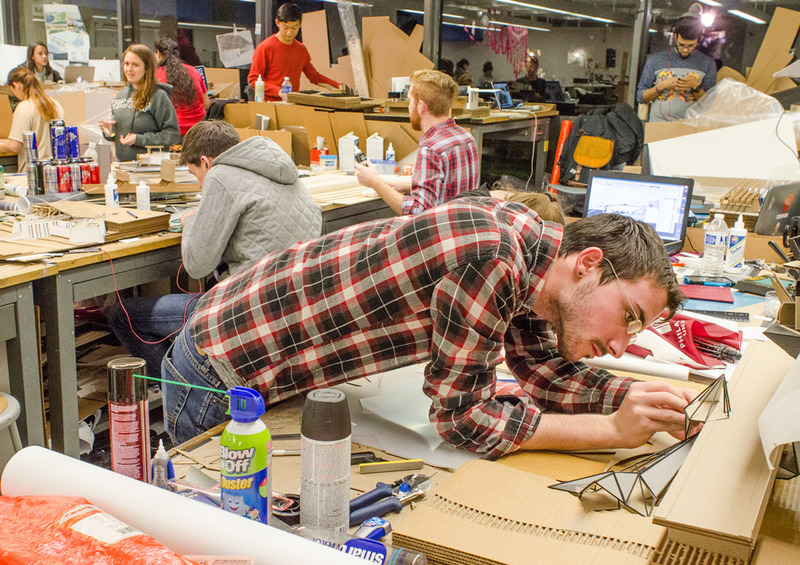 PhilaU architecture students work in the studio. Philadelphia University’s College of Architecture and the Built Environment has received the 2015 NCARB Award to develop strategies for architectural textile composites for building envelopes. PhilaU will receive $34,208 in funding for an interdisciplinary and experimental architecture design studio to explore innovative approaches to architectural textile composites, the National Council of Architectural Registration Boards (NCARB) announced Nov. 13 at the Association of Collegiate Schools of Architecture’s administrators’ conference in San Juan, Puerto Rico. PhilaU students in architecture, engineering and textiles will study emerging technologies, new materials and environmental issues, and demonstrate how architects can drive the creation of innovative materials systems and technologies. The project will get underway next semester as a pilot course open to fourth- and fifth-year architecture students, and junior, senior and graduate students in industrial and textile design. The course then will be assessed, with the expectation that it will become an ongoing electives option, and possibly expanded to include other disciplines, said Kihong Ku, associate professor of architecture, who spearheaded the proposal. Other faculty members collaborating on the project include Christian Jordan, adjunct architecture professor, Lyn Godley, associate professor of industrial design and Marcia Weiss, Harold Neuman Textile Design Chair and director of textile design, as well as architects Petra Stanev and Ryan Lohbauer of stanev potts architects. The NCARB award jury “recognized the proposal’s interdisciplinary collaboration and rigorous assessment of its outcomes,” the organization said. The NCARB Award for the Integration of Practice and Education is designed to help schools implement new programs that bridge the gap between practice and education in a classroom, seminar or studio setting. In addition to PhilaU, architecture programs at Mississippi State University and University of Florida also received awards. Read the Architect story on the NCARB Award here.